I was in the passenger seat of a van driving around a small village in Brazil, looking for some props and a few people interested in a bit of acting. The driver of our van was wearing a Brazilian Air Force costume (except for his sandals), and one of the local villagers sat in the middle with us. His name was Jefferson and to my surprise he had just put a Morrissey CD on, telling me in broken English that he’s a big fan. Occasionally we would stop by someone he knew, and he would lean out of the window to ask the mate that he’d seen if they wanted to come with us. People would look into the van and see me holding some firewood and grinning stupidly, our driver who would simply tip his garrison cap at people to say hello, and throughout all of this the dulcet tones of The Smiths were blasting out of the vehicle for the whole neighbourhood to hear. Driving through the jungle with this ragtag gang has to be up there as one of the most surreal moments of my life. 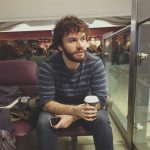 But this was the situation I found myself in back in February 2014 – I was a part of a film crew working in Belém, a large city in the north of Brazil known as the gateway to the Amazon River. We had travelled a few hours out to a little village for some additional filming, and I was on an errand with these guys. Unfortunately the driver was more the silent type, Jefferson only knew Morrissey lyrics and I cannot speak much Portuguese. I was desperately looking for some common ground on the long journey in the van back to the set, and noticed something promising: Jefferson was wearing a football shirt. Football is the perfect unifier, especially in Brazil where the sport is absolutely huge, and it was the year they were hosting a World Cup. I asked him a bit about the team as best I could (i.e. pointed and gave a thumbs up), and he excitedly tried to tell me a bit about them. I might not have thought much more of it, but a few days later when we had finished filming Jefferson gave me the shirt as a gift, as I’d displayed some interest in it. I got a photo of the two of us with the shirt as it was a great gift after a fun shoot, and after that we headed off to get a flight to São Paulo, and later back to England. Now I hadn’t given much thought to the shirt since then other than seeing it as a cool bit of memorabilia from the trip. I tend to use it when I’m playing sport or when I’m travelling, but after a while people began asking me what team it was. I had to admit that I knew nothing, not where it was from or even the name of the club. 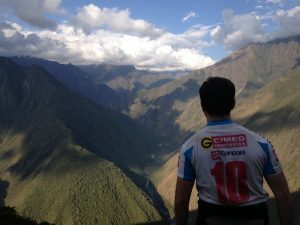 The best I could offer was that it looked a bit like the Argentina national team jersey, or arguably even more like the clothing that the bananas wore in that 90’s show we used to watch as kids called Bananas In Pyjamas… Either way, I resolved to have a search for the team and the history behind them, to learn more about the story behind the shirt. The first clue I had was the ‘PSC’ on the jersey, and I discovered that the initials stood for a team from Belém known as Paysandu Sport Club. They are in the second division of the Brazilian nationwide league, having been formed in 1914. It turns out that they had a slightly unusual formation, coming as the result of an argument. 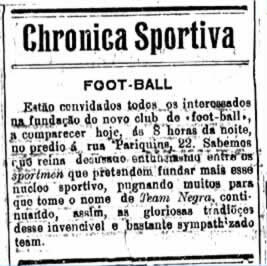 A team known as the Norte Club had controversially drawn a game in November 1913 which had handed the state-wide league title to their local rivals, Grupo do Remo. As a result of this highly controversial game, club members felt changes needed to be made to make them stronger for the future. 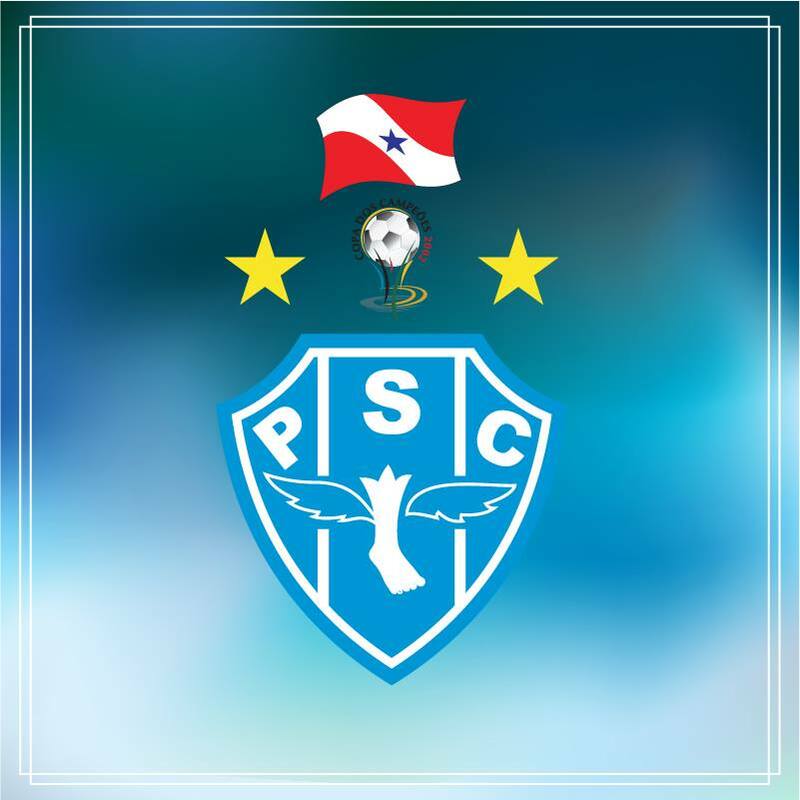 On February 2nd 1914, a meeting was held which resulted in the formation of Paysandu Sport Club. I must admit that the first thing that caught my attention about the Paysandu Sport Club shirt was the badge. 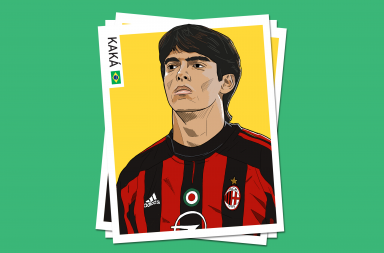 In fact, it features a winged foot of all things – it is such a quirky choice that to be honest it makes for a very apt choice for our Badge of the Week feature. Perhaps it is a reference to that Greek God called Hermes who had winged sandals… In quotes I have seen it has been suggested that the winged foot represents that Paysandu can scale to, or indeed in this case fly to, heights that other teams couldn’t dream of reaching because they are lacking in wings – literally the sky’s the limit for Paysandu thanks to this. Granted, it is one of the more unusually literal ways of explaining this, but I guess it makes sense… Much more obvious was the origin of the club name. I learned that they are not named ‘Paysandu’ after any location existing in Brazil, but instead after a city in Uruguay named Paysandú (in Portuguese it loses the Spanish accent on the ‘u’), where a brutal and bloody conflict had taken place during the Uruguayan War of 1864-1865. The month long siege of the Uruguayan city by Brazilian and Colorado forces was the defining moment of the war, and the club name was thus named to forever commemorate this important event in the history of the South American continent. 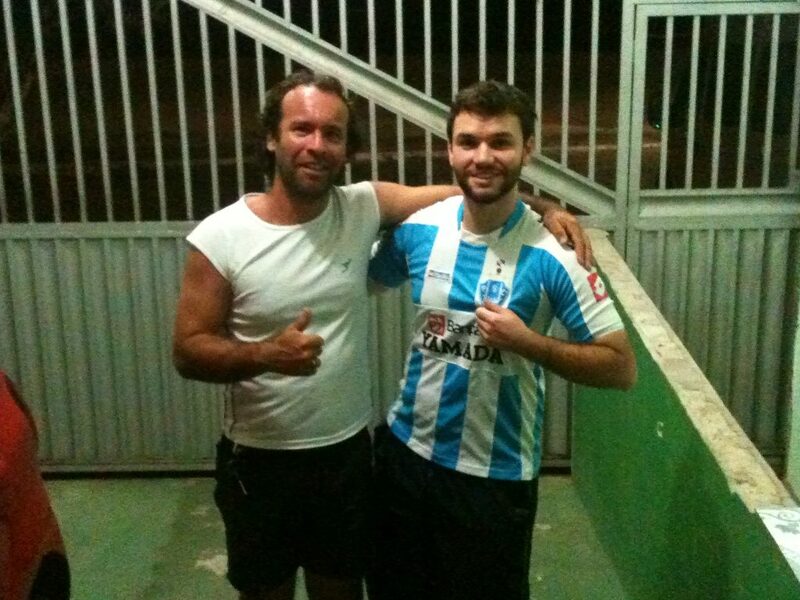 Another thing that makes Paysandu Sport Club noteworthy is one of its local rivalries. Remember Grupo do Remo, the club who led to the clubs formation? Well they are now known as Clube do Remo, and the rivalry between the two is amongst the biggest in northern Brazil. This historic confrontation is known to some simply as Re-Pa, and to others as Clássico Rei da Amazônia, which translates as ‘Classic King of the Amazon’. I looked on Paysandu Sport Club’s website and they have a ‘Club History’ section which mentions the first Re-Pa game, which Paysandu lost 2-1. 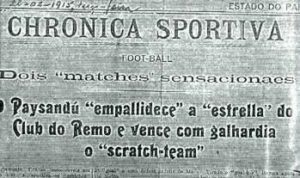 It says a lot about this grudge match that they even take the time to mention that the 1914 game was lost due to a dubious penalty, and then a paragraph later to also the 1915 newspaper headline for their first win over Remo… Priceless. The two sides have played an incredible 734 games against each other, a number that few rivalries could compete with, with Remo currently edging the head-to-head record. To put that into perspective, the two teams have played over three times the number of competitive games that Spanish El Classico rivals Barcelona and Real Madrid have competed. 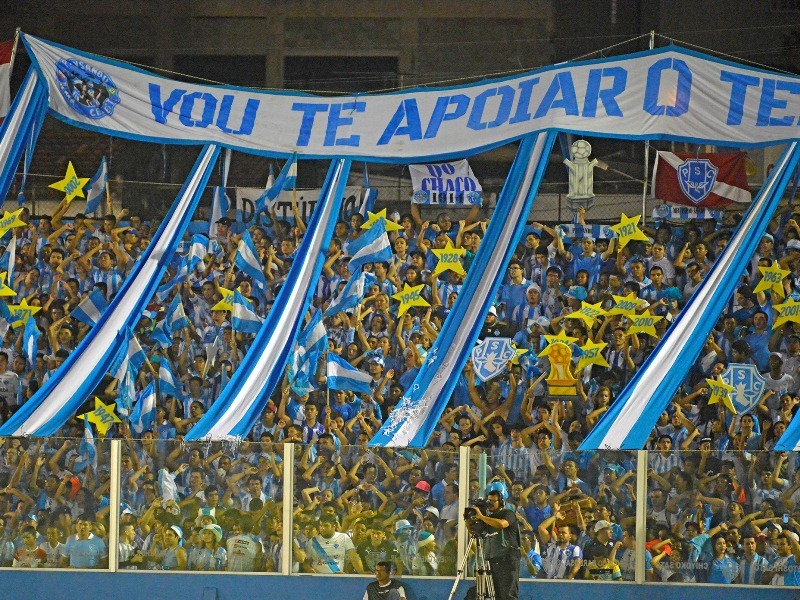 In England we have The Red Devils, The Toffees and the Gunners, but what is Paysandu Sport Club known as by their fans? One nickname for the team is ‘Papão da Curuzu’, or ‘The Bogeyman of Curuzu’ in English. Curuzu refers to the road where their 16,200 capacity stadium is located, which seems logical, but why a Bogeyman? Well, it all comes from to a journalist called Everado Guilhon who wrote for a newspaper called Vanguarda in the 1940’s. When he was a child, his mother always used to warn him of the bogeyman to get him to sleep sooner. In 1948 he used this childhood monster to describe Paysandu Sport Club, as at the time they were a formidable team who inspired fear across the north of Brazil in the 1940’s, winning 5 state-wide titles in 6 seasons. The name stuck, and to this day the club mascot is a wolf called ‘Bicho Papão’. The club’s rich history has provided other nicknames of equally strange origin – they are sometimes known as ‘The Swiss Club’. This is the result of a player called Antônio Barros Filho, a local lad who studied in Switzerland along with his brother. He is said to have been one of the best players that the state of Pará has ever seen, capable of playing any position on the field but at his best playing for Paysandu at left back or centre midfield. 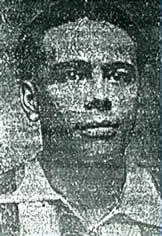 He sadly died in 1922 at a very young age, but has been remembered by the club ever since. 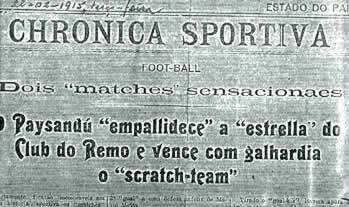 In one Re-Pa game in 1923, Remo won a penalty in the closing minutes when the score was 0-0, a chance to win the game. Paysandu goalkeeper João Moraes said after the match that he heard the voice of the ‘Swiss’ legend, telling him to dive to the right. He did so, and saved the penalty, and the story lives to this day of Antônio Barros Filho. Things like this paint a picture of Paysandu to me of a team that is both passionate and combative. 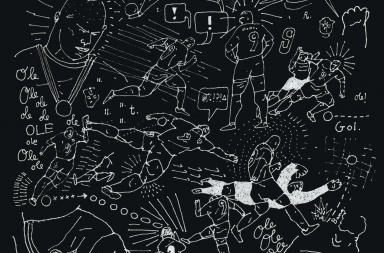 Born of an argument over a result, and named after a wartime conflict, you’d be forgiven for thinking of their home ground Estádio da Curuzú as a battlefield across the ages, where even the ghosts of the past return to help the team triumph in conflict. But what of the triumphs and failures of Paysandu over the ages? Well if this story has taught me one thing, it is that Brazilian teams play a lot of football. Paysandu are involved in 2 leagues – a state-wide one in the northern Brazilian state of Pará called the Campeonato Paraense, and they are in the second tier of the nationwide Brazilian league called the Campeonato Brasileiro. 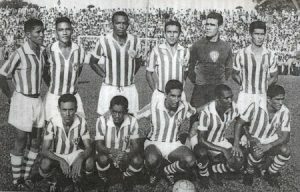 They have won the state-wide competition 45 times in their history (the first of these coming just six years after their formation), and the Campeonato Brasileiro Série B twice. They have gone through hardships as well however – successive relegations in 2005 and 2006 moved them from the top tier of Brazilian football to Série C, but they have clawed their way back to Série B where they finished 7th in 2015 (Brazilian league seasons follow more of a calendar year schedule than our August-May European leagues). All clubs have their ups and downs, and for all their local triumphs Paysandu Sport Club’s most famous moment would have to be in 2003, when they captured the imagination of the continent and gained worldwide recognition. 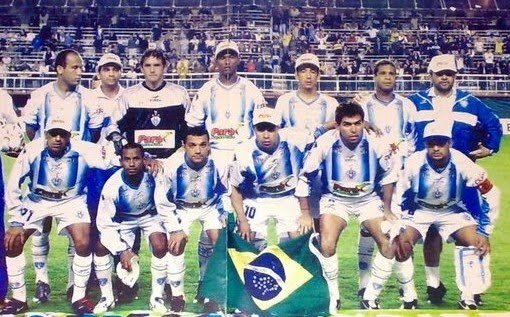 In 2002 Paysandu Sport Club had won the Copa Norte, a regional cup that put them through to the Copa dos Campeões against other regional cup winners in Brazil. The victor of this mini-tournament gained qualification to the Copa Libertadores de América, one of the world’s most famous football tournaments and the South American equivalent of the UEFA Champions League in Europe (for the record a sponsorship deal means that it is also currently called Copa Bridgestone Libertadores). 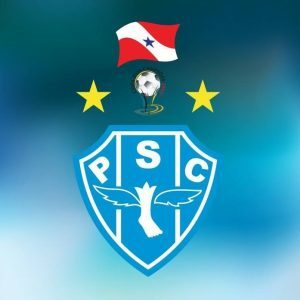 Paysandu Sport Club won to gain entry to this revered tournament for the first and so far only time in their history, and they remain the only side from the north of Brazil to ever qualify. It would be understandable to be a little intimidated by a tournament that contained world-renown teams from all over the South American continent like Santos, Corinthians, Cerro Porteño and Boca Juniors. But far from rolling over against more illustrious opponents, they shocked everyone and topped their group. Led by the form of club hero Robgol who ended the tournament as third top scorer with 7 goals, Paysandu Sport Club entered the Second Round of the tournament with relative swagger. Their record of having won 4 and drawn 2 also meant that remarkably the northern minnows were unbeaten, the highlight of the group stages being their hugely impressive 6-2 away win against group favourites Cerro Porteño from Paraguay. 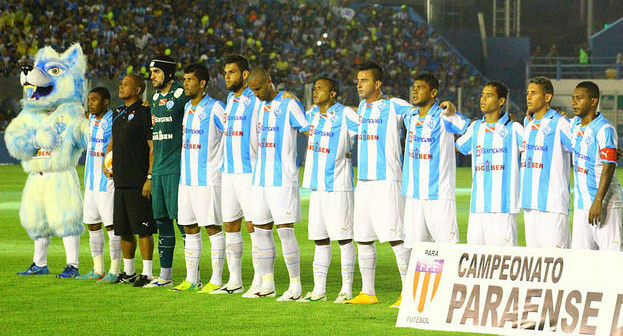 But Paysandu’s reward for such good form was to be drawn against the Argentinian side Boca Juniors in the Round of 16. This side was star studded to say the least, even featuring a young Carlos Tevez who would become known across the world in years to come, playing for both Manchester United and Manchester City as well as Juventus and West Ham (Tevez has now returned to Boca Juniors to play for them once more). They had won the Copa Libertadores four times at the time and had a budget that Paysandu could only dream of. It would be like pitting Bayern Munich against Watford… What’s more, Boca Juniors had only lost twice at home to a Brazilian club in the past 40 years, so surely some unknown team from the edge of the Amazon stood no chance? But the Bogeyman from Belém had other ideas, and attacking midfielder Iarley scored the only goal of the game to ensure a shock 1-0 away victory at La Bombonera that might just be the most famous in Paysandu’s 102-year history. For the return leg they played Boca Juniors at the 45,000 seat Estádio Olímpico do Pará, as it is significantly larger than their usual home ground. Unfortunately the dream ended there, as a 4-2 defeat on the day gave them a 4-3 aggregate loss in the tie. Boca Juniors went on to win the tournament that year. In fact they won 7 straight matches beginning with that 4-2 win against Paysandu Sport Club. The men from Belém remained the only side to beat Boca Juniors at La Bombonera that year, and in doing so they won the hearts of the continent. 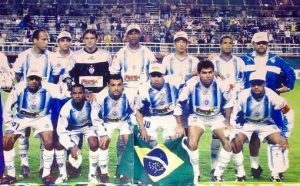 Paysandu Sport Club ended their 2003 campaign with their heads held high, scaring even the mightiest of opponents and thrilling their adoring fans along the way. Now, I’m a Tottenham Hotspur fan and much like this team from the north of Brazil, my team from the north of London has only qualified for the big time tournament once in our history. We also topped our UEFA Champions League group in 2010-11, beating big teams like Inter Milan and AC Milan along the way with players like Gareth Bale becoming known on the world stage as a result. Yes we came undone against Real Madrid in the end, but the journey was incredible to watch and I will always remember it. We left with our heads held high despite our underdog status in that tournament, so I can understand how special this year must have been for Papão fans, and they achieved it with next to no money and even less expectation than we had. What’s more, their tournament record of 5 wins, 2 draws and 1 defeat to this day gives them the surprising honour of having the best percentage record of any Brazilian team in the history of the Copa Libertadores, which is incredible given where they stand in Brazilian football. I can only hope that they will enjoy another fairytale story soon, but the 2003 season where this small team conquered much of South America will certainly be one that the fans never forget. Looking into the history of Paysandu Sport Club has taught me that there is a fascinating story behind every team, every shirt and every supposedly small part of the world. 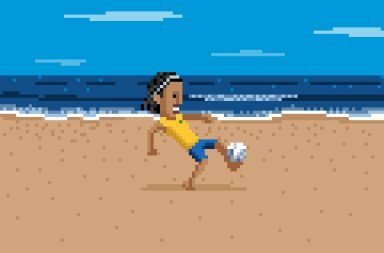 Football is the biggest sport on the planet, bringing people together like no other, and in Brazil it is arguably more than a sport – it is akin to a religion. When I was given the shirt, I wore it to dinner with the crew before we headed off, and I sat next to our driver. He was an old man with a friendly face, but very quiet and hadn’t actually said a word in Portuguese or English the past few days I’d been with him. But when he saw me in this shirt he grabbed my arms, smiled widely and said, “Beautiful!”, before getting up and walking off for some dessert. I asked the others what had happened, and it turned out that he supported Paysandu Sport Club. Just how many football clubs are there in the world that you have never heard of? You see, football can ignite rivalries, grudges and fierce competition year after year, but it also inspires camaraderie, friendship and even a bit of unbridled joy every now and then. Across the world there are simple similarities and experiences that we can all relate to as football fans, and no matter what language you speak you can still bond through the sport. And it’s refreshing to learn that no matter where you go, no matter how far away from home you are, there is always a rich and interesting new story to discover. I had always wondered about Paysandú. I knew that it was a place in Uruguay and was always confused about why this team in Brazil had that name, Thanks for clearing the confusion! I'm a Paysandu fan reading your wonderful article here in Belém, and I have to say man: Your way to tell our story made me cry some tears of joy. From know on I intend to show this article for every Paysandu fan that I know. Hello - I am glad that you enjoyed the article - it was really interesting to learn more about your team in my research! Will Neymar’s move to PSG prove a boost to Brazil’s chances in Russia?